The only supplements I use are sweat and tears, but I hear good things about GNC. Today they are offering a 3-for-$25 offer and $1 shipping. There are over 40 different items included in the deal, but you have until midnight to take advantage of it. So that Triple Strength Fish Oil that's $25? You'll get three for that price. 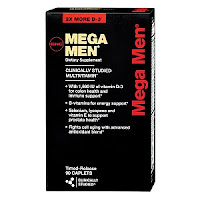 That GNC Mega Men Sport that's so popular with the kids today? It may run $18, but today you'll get three for $25. Creatine Monohydrate that busts out those muscles? It costs $22 normally but... well, you get the picture. Click here to view the sale at GNC.